Before I get into this I want to say that I've met Iranians socially over past decades and I've always really liked them. Iranians, Iriquis, Qatarians, Saudis, etc. The ones I met were all mostly pleasant, smart, nice people. Not always enamored with their government leaders for the most part. Wishing mostly that they could separate state and religion. But then they were living in America, too. 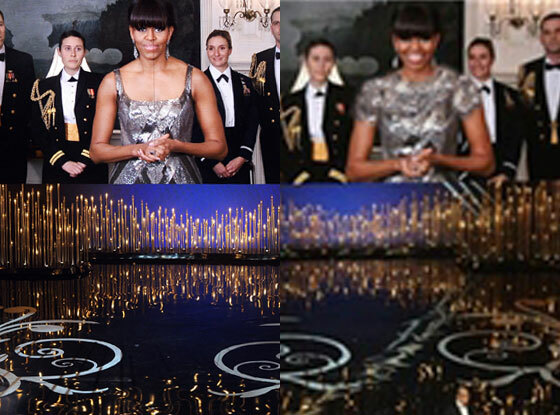 Michelle Obama's Oscar Dress was Photoshopped by Iranian [State] Media (photo from E). I could almost understand that that, but not really. You don't alter reality, you cover it up, though either way, you're avoiding it. What kind of religion cannot face reality in face of its beliefs? Not a very strong one obviously. A flawed belief system. How are we supposed to have any respect for a country or a belief system that requires it and it's adherents to patently avoid reality? 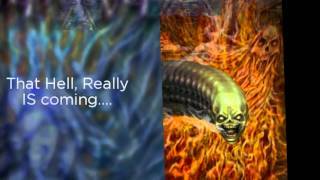 What kind of God requires that reality be ignored and lies inserted in its place? Christians? Take heed. This includes some of you. Any religion, especially a State religion that requires avoiding reality is a travesty. No news there, really. Religion should help you face reality, not avoid or hide from it. That is no belief system at all. Religions should help you have the strength, the Faith, to support you through reality. Hiding from it is useless. It's a way to make a system work when it doesn't, to give the impression that it is working, when it isn't. Catholics are good at this too (see, pedophilia, wonder why they are whitewashing things by sending the Pope off to retirement). Yes I do realize this is more of a political thing, as with the Taliban, a cowardly, fearful institution ("God Fearing" people right? Therefore it would seem, Cowards. From what I can see, we can include the Iranian Government and their Ayatollah. Yes I said cowardly, something rampant in Muslim extremists including terrorism. Yes, suicide bombers are cowards. Maybe Bill Maher was wrong. How? When you are too fearful to face reality head on, to live in the modern world, think you are an anachronism (you are), then you die to escape reality. Cowardly. Bill was right that it takes guts to fly a plane into a building, but when taken in context of avoiding reality, it really is cowardly. It's the easy way out. Bang, you're dead, really no long term effort. Consider this. You're sitting in a fox hole or behind a rock wall. The enemy is shooting at you. You go through this day in and day out. There is no escaping it. It's wearing on you. The "good fight" isn't working for you. You are facing overwhelming force. You may be caught, maimed, killed, tortured. God knows? Right? Isn't it just easier to kill yourself? Many "cowards" take this way out in the face of fear, but also in the face of too much effort. Such as conqueror the "West", the "Great Satan", the "Rest of the world other than your small contingent of losers". But is it cowardly to shoot yourself to avoid the real battle before you? Or to fly a plane into a building? Well I'm sure this isn't something Iranian media does normally. Photoshopping women, that is. The wife of one the leaders of one of the greatest nations in the world. Something that Iranian despots wish they were (but refuse to take steps so that it can actually happen). But they were probably just thinking of proper decorum in dress for a woman, in not showing skin. Because that's the place of men in the world, to be sure women do what is right. Right? I'm sure that's it. They wouldn't do this about something related to one of their own, a Man. They wouldn't alter what an Iranian Man would like, say. Right? Last year at the Oscar's Iran couldn't handle some words spoken by one of their directors when he received his. "I proudly offer this award to the people of my country who, despite all the tensions and hostility of recent months between Iran and the West over Iran’s nuclear program, respect all cultures and civilizations." “At this time, many Iranians all over the world are watching us, and I imagine them to be very happy. 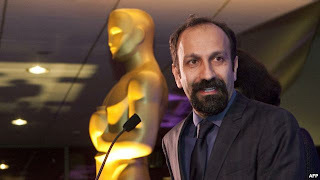 They are happy not just because of an important award, or a film, or a filmmaker, but because -- at a time of tug of war, intimidation and aggressions exchanged between politicians -- the name of their county, Iran, is spoken here through her glorious culture, a rich and ancient culture that has been hidden under the heavy dust of politics. "I proudly offer this award to the people of my country, the people who respect all cultures and civilizations and despise hostility and resentment. Thank you so much." Countries and religions like we see in Iran are going to continue to be a laughing stock in the world forum and not be taken seriously, until they clean up their childish foolishness. Get out of the middle ages, Iran. Please note that this goes to the Iranian leaders, not the Iranian people. Like in America, two different groups entirely. So grow up Iran. No one is going to give you the respect you so badly desire. That's another immature flaw, respect is earned, not scared out of people. Fear only gets you attacked, leading to a war in order to wise you up (remember Iraq?). So get your act together Iran. And not just you. But any nation of buffoons (North Korea). You are quickly becoming an extinct elite of destroyed dictatorships. After all, Iran still has the Ayatollah who is pretty much still running the show, nothing like a dictatorship direct from God, right? How could THAT ever go wrong? Dictators are on the way out. Wise up. Besides, it's just a matter of time. Update on what's going on at JZMurdock.com. I thought I should mention that my second audio book. 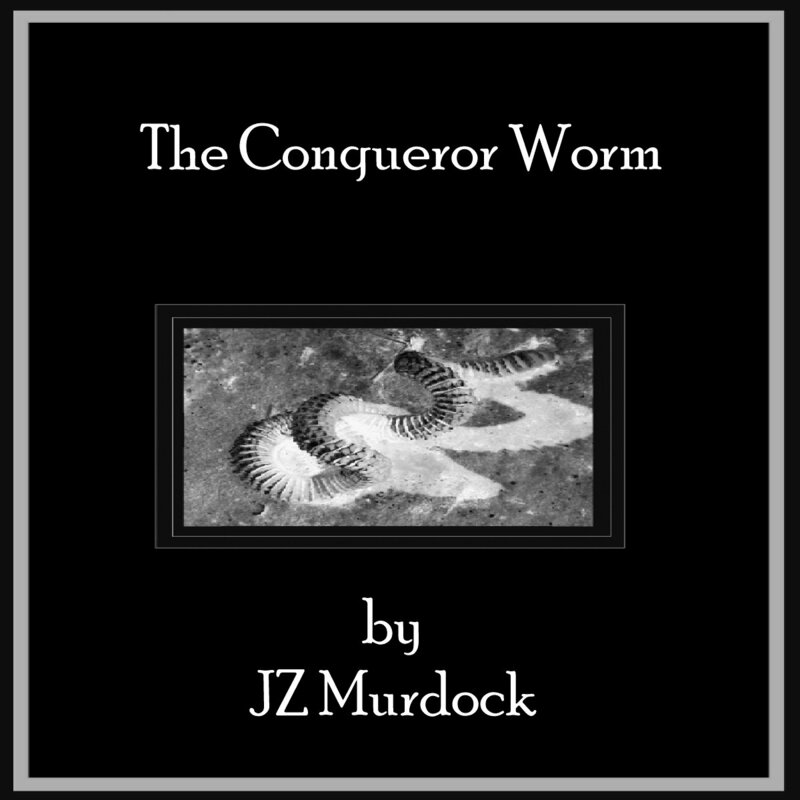 "The Conqueror Worm" is now available on Amazon, Audible.com and iTunes. 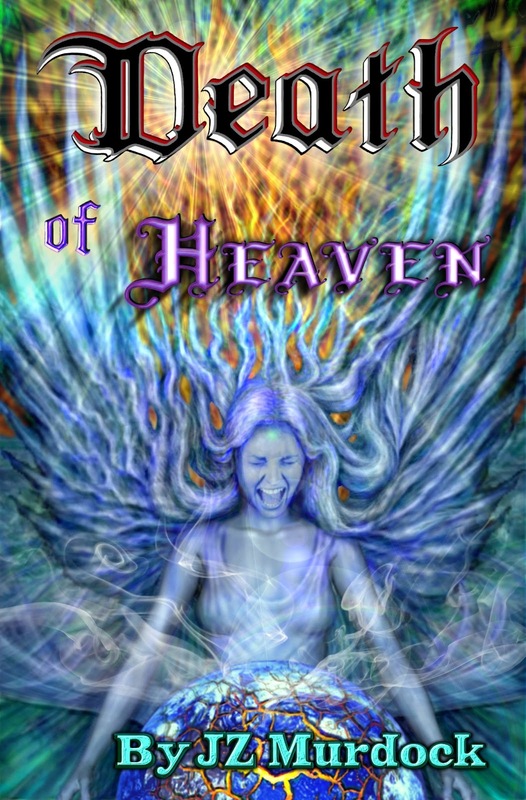 Although this is the opening chapter for my book, "Death of Heaven" and has also been available as a separate ebook, it is quite a good little standalone Horror story. I'd also like to say that my short Science Fiction story, "Expedition of the Arcturus", will see it's world premiere on PerihelionSF.com on March 12th, 2013. A pretty good story if I do say so and it couldn't have been more timely considering all the talk about impending meteorites and asteroids crashing into the Earth. This was my second submission to the editor at PerihelionSF, so don't think they are a push over to get a story in their online magazine. Although I do also have a film review on there from last year on the amazing documentary, "Chasing Ice", the theme song of which was nominated for an Oscar and included the world class Joshua Bell on violin and the incredible Scarlett Johansson's voice, you don't get a story on PerihelionSF if it doesn't fit the bill. Trust me. This is the second audio book I have produced with more to come. I seem to get better with each one. This has a touch of music. I hope to add more sound F/X as I get better at the sound production. My first book, "The Mea Culpa Document of London" is about a witch hunter and judge during the Inquisition in England. 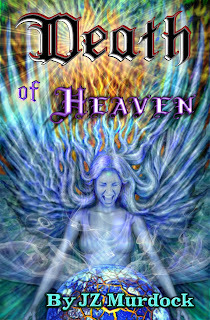 I will be putting these stories out as audio books from this collection of my short stories until they are all completed and then I will put them together as the full book ending with "Andrew", which is the precursor for "Death of Heaven". This is a story about two twelve year old boys. Playing in the yard, they decided to dig for buried treasure and what they find is beyond their expectations. The next few hours change their entire lives and set the tone for the rest of the book. But as I said, this is a perfect stand alone story and one of the best things I've written in the realm of Horror. Jimmy and James start the afternoon digging in the dirt and end in the middle of the night changed forever. But the story doesn't really end there. "Death of Heaven" continues their nightmares into adulthood and events that change the world, forever. And the Universe. I was just watching a great little film called, "Carnage", directed by Roman Polanski with Jody Foster, Kate Winslet, John C. Reilly and Christoph Waltz. A kind of modern day "Who's Afraid of Virginia Wolfe". Entertaining, well done film. Anyway, Jody Foster's character, "Penelope" asked the question in it that sparked these thoughts for me. "Why is life so hard." Why is life so hard for some people and seemingly, so easy for others? Many of us, maybe most, go through life without thought to their actions and reactions to those actions. We don't tend to consider that what we do, has affects beyond our primary intentions. But some people do. They think about it, or it's second nature to them. For whatever reason, genetics, breeding, environment, luck. Yes, Luck. In some cases, some people seem to be naturally, "Lucky". Defined by the Free Dictionary as: "The potential ability of individual organizations or groups to be more successful or productive as a result of a merger. Also called synergism." It's a kind of Gestalt, in reverse perhaps. If you do something for a reason, and achieve that reason, then you have achieved a primary condition. If however, that also enables or causes another action that enhances your primary efforts, or other related or unrelated things to happen, especially if those other things enhance some other area of your life, or your efforts, then that is synergy. If you get into the habit of doing things with secondary and even perhaps tertiary or further, then you are building a kind of Karma that will echo back on your life and efforts immediately or at some future date. When you do these things so that they interact with other things you have done, then you are perceived as being charmed, successful, or in throwing caution to the wind, Lucky. Going through life is like you are following a road. For most people, they just follow the road. Some, maybe most, deviate by maybe a few degrees throughout their lives. Some deviant to the high road by great or very high degrees and good things always seem to happen to them. Some of those seem to work for it all the time, other's it just seems to come to them naturally, with little or no effort. But there is another direction, the low road. These people are just like the other people, but they go the opposite direction in life. Things are always hard for them, bad things seem to befall them at every turn. It is like they are cursed, or someone is watching them and doing whatever they can to ruin their lives. I think for most though, life just seems difficult ("Why is Life so hard?"). And that is because of choices. How they react to life, what they put into it, how they treat others, themselves. It's also about how their attitude is. How it is about themselves, about others, about things in general and things in specific. I do believe that positive draws and breeds the positive. But that's only a part of it. Most of it is in how you do whatever you do. Think about it. If you close a door quietly, every time. People react to that. The door sustains a certain amount of wear and tear by way of the action of closing it. If instead, you always close it as hard as you can, it will be hard on the door, the frame, the hinges the lock. It will be hard on your arm, most likely, too. It will generate a lot of noise which will lead those who hear it to react in a certain way. Possibly if someone sees you start to close the door, they might even flinch. But if they know you always close the door gently, they will either not notice your actions much, or perhaps, they may even smile at you. What you want to do in life is be as lazy as you can. That used to bug my ex wife when I'd say that. I've heard other pay mention that attitude of mine. One guy told me recently that he thought I was just some kind of laid back hippie type who didn't do much. But then he heard what I've done in my life, what I was doing now, and saw how and what I do normally in a working environment and said he had to admit he was impressed at how much I have done in life and still do. It's all about my demeanor, my being relaxed, remaining calm, having a sense of humor, especially when things are going wrong. Still, it is also about how you approach issues, how you construct your solutions and implement them. My ex wife used to work very hard. But she wasn't working smart, just hard, with little recompense for her efforts. I had a lot of respect for the amount of work she did, her perseverance Still, at some point you have to recognize if there isn't an easier or more economical way. Here's there thing. Whenever you do something, complete a project, implement a solution for a problem, set something up, do it in a way that it will sustain itself. So that if will solve some other issue in it's being implemented, so that others or some other will also benefit from it. So that it will make some other issue easier to deal with. So that later something else will come of it, that will come back to you or others. If you can do it in a way that it becomes obvious you had something to do with it, all the better. But to set that up solely for that purpose, isn't as productive as it being inherent in the solution. If you see what I mean, and what there difference is in that. Some of those who seem to have it good, may be carried along on the force of certain things no one can have control over in real time. Things like who you are born to, where you are born or grow up, the times you are alive in, and so on. Some of those things can be brought to your benefit by invoking change to your benefit. Some you may have to actively work around in order to bring them in line with your needs, desires and challenges. If you find any of this interesting, you might consider reading "The Prince" by Machiavelli in 1513. Wikipedia says this about it: "The Prince is sometimes claimed to be one of the first works of modern philosophy, especially modern political philosophy, in which the effective truth is taken to be more important than any abstract ideal. It was also in direct conflict with the dominant Catholic and scholastic doctrines of the time concerning how to consider politics and ethics." You can read the book and head in a dastardly direction with it. But if you also consider the Golden Rule, and always treat others as you would like to be treated yourself, then you will see the positive from the negative in the reading. What I'm trying to say here is that by our actions, we can excessively help ourselves, or excessively apply impediments to our lives. For most, we just get by. Sometimes getting a little up, sometimes down, sometimes very up or down. Mostly we don't see why these things are happening. My contention here is this: we can change all that. Or most of it, or at least some of it. We can change our "Luck of the Draw", by selecting the Draw we choose as our Luck. Partly, the solution is to just be aware of this situation. "Be" in the moment. See what is going on around you. See the connections things have to other things. When you act, act to the maximum possible. Try to think a step or two, or three ahead, or beyond. Ask yourself what good will this solution be to me, to others. What others? If your solution to anything is only solving one thing, try to see your way clear to see more than one thing that can by positively affected by your actions. Do things to benefit others, not just yourself. It seems like a waste at times, but it does come back to positively affect you. Not always, some of it is waste, it does you no good whatsoever. But it builds a habit, and attitude, an orientation, that does come back around to positively affect you. It may take a year, two, or three. But if you do all this, I guarantee you that you will start to think, How did life get so much easier all of a sudden. And I will also guarantee you, it won't just be, "Blind Luck". How about some positive news? Happy President's Day! I hope you got the day off today. First, I received some good news over the weekend. My short Sci Fi story, "Expedition of the Arcturus" will be published on 3/12/2013 on PerihelionSF.com. It couldn't be more timely considering our concern over meteorites and asteroids recently. And if I might make the bold suggestion, drop by their web site any time. It's a great "hard" Science Fiction magazine. We have gotten hammered with negative news for years now. I don't know about you, but I'm tired of it. Sick and tired of it. Isn't there anything going well anymore? Anywhere? Bill Gates of Microsoft fame, has released his Annual Letter to the world and it contains some insight as to how things are really going overall, and world wide. And nationwide here at home, because we do have some very good things going on right here. We just haven't noticed them because of the economic situation and political gridlock. You should notice that political gridlock tends to occur during times of there being confusion about what to do in order to fix problems. The lack of ability to affect positive changes has come from, in my opinion, poor education of the leaders of our constituents and their polarized political agendas (basically, the GOP is stuck in their right wing, excessively conservative rhetoric). Bill and Melinda Gates have been traveling the world with their, "Bill And Melinda Gates Foundation", affecting positive change worldwide. He has pointed out a few things we do need to do. One I'd like to mention here, is about teachers. Teachers are a group that have taken a lot of flak and undeservedly so. They are underpaid and overworked. As Mr. Gates pointed out recently, they have not been given the same tools business has given to its employees. Rather than testing the teachers, why not give them feedback? Rather than berate and attempt to remove those who are there (and if they are truly incompetent, they should be removed, but they should never have been there to begin with), they need access to how to deal with problems they are having. They need our support, not our recriminations. They need information, not just a pink slip. How do those teachers who are successfulat dealing with trouble students deal with the situation. Or in teaching a difficult or complex subject, how do the successfulteachers, teach it? Let's share that. Let's stand up and take responsibility for getting teachers the tools and methods they need to affect positive change in their environment, because their environment is particularly important to us as parents, as a nation. And as a world. Another measurement for progress worldwide, is about children under age five dying. They are dying now less than before, the numbers are dropping. In 1960 twenty million children under age five were dying each year. Within the next few years, that will be down to three million. Polio is down to just over a couple of hundred cases worldwide and may soon be eradicated. Mr. Gates also pointed out things like the ability to have information at the touch of your fingers. Being able to sit with your child in your home and explore the world online. Think about that for a moment. Appreciate some of the things you now take for granted. The technologies and devices we have that make our lives easier every day have changed how we do business, how we live and how we interact with one another. Has technology closed us off from one another, or brought us closer? Yes, I do see people I know less now a days, and we live further apart than when I was younger and I mostly knew people within a close physical distance from me. But technology has brought us closer together, in some ways removing that distance. I know more now about what my kids, family, friends, and new long distance friends and acquaintancesare doing, than I ever knew in the past before these technologies. The wealth we as Americans experience and live with every day, as opposed to those around the world who are starving or dying daily, can be invisible to us. Yet, even those people's lives around the world are getting better. They are starving and dying less. Yes, there is still much to do, but we are making pathways to success. For those who think the world is a horrible place, Mr. Gates has pointed out that things are getting better all the time, and are markedly better than only a few years ago. To support his contentions, last year the Dalai Lama, as another world traveler who should know, has been saying this same things. That violence worldwide is actually down from years ago, even though it doesn't look to us that way in media and news. Which points out that we need to carefully watch where we get our news and information from, because media has become oriented through entertainment more than journalism. The bottom dollar has become more important than the accurate, neutral delivery of real news. News departments should not be attached to a profit margin. It used to be that other departments covered that for them. That is one change that has certainly denigrated our news and information. But believe it or not, the new injection of Al Jazeera buying Current TV, which Al Gore just sold to them, might be just the sort of catalyst we need. Regardless of where they come from, I have to say I would trust news from them over Fox News (after their recent, horrible showing, in their consistent inaccuracies, during our last Presidential election), any day of the week. Last year my own daughter returned from backpacking all over Europe, going to Eastern Europe to places I was afraid for her to go. Yet she returned safely and said those scary places were where she met some of the nicest people she came in contact with on her travels, and she felt the safest there. The most dangerous place she went to, turned out to be Athens, Greece during their riots with mobs and cars on fire and angry people hurting and getting hurt. So don't feel too depressed about "Today" because apparently, beyond our vision, out of our line of sight, just outside of our available information, and in many cases even right in front of us, in our own homes, there really are good things happening. The world is having a difficult time, but not in every area. Overall it would seem that efforts really are paying off and turning the planet into a better world. In many cases, without our even recognizing it. NOTE: I just wanted to say, to those of you who have donated money to help this family out this week, from them and myself, Thank You So Much! A very good friend of mine recently had a serious scare in his life. He almost lost the person closest to him in his life, aside from his daughter, that is. I've known him since I was having trouble in my own life back in 1992 around the time we first met. He was the nicest guy in the world and working at a local establishment that has a fond spot in my heart. A local brew pub called The Big Time Ale House on the "Ave" in the "U District" in Seattle. My marriage was disintegrating around me. I had a four year old boy. I had bills. I ended up living in a house where I rented a room from the woman who was leasing the house. It was a sad period in my life. At one point, I was working two full time jobs so that I could get enough money to buy my son a Christmas present. I had been eating top ramen for my one meal per day. I got a second job at a bakery making Pasty's. I was working for a Ex Pat Brit who also ran a Pub on the "Ave" called The Unicorn. During this time I was hanging with this friend in my off time when he was available. A bright light in an otherwise dark period. Then he moved to California for a while and we lost touch. After a whille he moved up to Portland and eventually got married and had a daughter, Mollie. Recently his wife, had a medical scare and we were quite worried but she came through it. They came through it, but as our health care is in America (and don't get me started on that topic), they are now left with bills from it. They are good people, they are hard working, small business people. The started a business last year cleaning houses. The two of them. Now, just he can do it. They got their dream started up, things were going well, then this happened. To me, they are the cream of America, and they need help. If you've ever had a medical condition and came through it, but were left with large bills from it, then you know that the bills can be almost as devestating emotionally, as the original condition that almost killed you. I never understood that about healthcare. "Great, I survived, but the stress is killing me anyway and I may have a heart attack just from that!" The other day, on her own, their daughter Mollie put up a donations page. They didn't ask for it. She just wanted to do something to help. So I figured that the least I could do, after donating what I could, was to give others the opportunity to help too. If everyone that reads my blog were to donate $10, just $10, it would pay off their medical bills. All I want to do now is to post their daughter's words from her donations page and, if you feel moved, please help them out with anything. $20? $10? Even $5 would help, if enough people donated. So here she is and thank you for your time and consideration. This isn't something you will ever see me do very often. My name is Mollie and I am 18 years old. On December 26, my mom began experiencing severe chest pains. I called 911, not knowing what was really happening as they drove her to the nearest hospital. The next day, after testing, doctors informed us that she had a minor heart attack and needed to be moved to a bigger hospital where she could have her Angiogram. A few days later the heart surgeon suggested a triple bypass as her best option. For a diabetic with heart disease and three stints put in 11 years ago, he believed that bypass surgery would be the most beneficial to her. We were all scared, but we encouraged her to go through with the surgery. December 31 my mother had her surgery. After many anxious hours I got word that all went well, though she ended up needing a quadruple bypass instead of a triple. January 5, 2013 my mom came home. Though she is getting better every day, she is still in the process of recovering. My parents own a house cleaning business; however, since my mother will be out of work for up to four months my dad has completely taken over, while I stay at home. I am a full time college student, while also taking care of my mom in her recovery. With a huge amount of hospital bills, regular expenses, the cost of medication, and daily needs, we are very tight on money. We understand everyone is going through hard times right now, so any amount will help. Thank you for listening to our story and support my family in this difficult time. God bless. So, that was Mollie. Thank you for your time. Here is the link to the donations page.